Preheat the oven to 375. Wash the chicken and pat dry. Season both sides with salt and pepper. Arrange the chicken in single layer in a large roasting pan with the larger pieces on the outside and smaller pieces in. In a blender or food processor, add the wine, lemon juice, salt, pepper, one garlic clove, and Manzanillo olive oil. Blend until smooth. 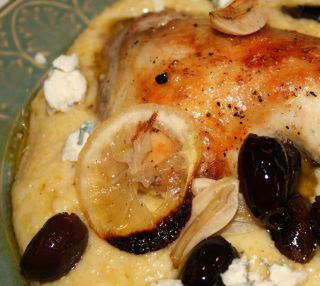 Pour the liquid over the chicken in the pan, making sure to drizzle over each piece of chicken Arrange the sliced garlic, lemon slices and olives around the chicken pieces. Sprinkle with thyme leaves and additional pepper if desired. Roast for 30-35 minutes until chicken is golden brown or until a digital thermometer inserted in to the middle of the thickest piece of chicken registers 165 degrees. While the chicken is roasting, heat 1 tablespoon of Cobrancosa over medium high heat, in a 3-4 quart sauté pan. Sauté leeks in EVOO for 6-8 minutes, until tender. Increase heat, add four cups of chicken broth to the sautéed leeks and bring to a boil. Add 1 teaspoon of salt. Gradually whisk in the cornmeal. Reduce the heat to low and cook until the mixture thickens and the cornmeal is tender, stirring often, about 20 minutes. Turn off the heat. Add the second tablespoon of Cobrancosa, and the blue cheese and stir until melted. Adjust seasoning and serve with pan juices from the roasted chicken.